At our Santa Monica dental office, we are constantly being asked by people how they can form the very best dental hygiene habits in their home so that their whole family can have the healthiest smiles possible. If you are anything like these people, your family’s oral health is likely extremely important to you. If this is the case, we have plenty of tips for you to follow so that you can ensure everyone in your household has a beautiful and healthy smile. Check out our suggestions below. Even though decay prevention methods are at an all-time high, one in every four young children will develop signs of decay before they even begin school. Additionally, half of all children that are between 12 and 15 have one or more cavities. These numbers are staggering. This is why is it so important to teeth your child about the importance of oral hygiene at a young age. While you may have to simply wipe your child’s teeth when they are first born, by the time they are two years old, they should be brushing their own teeth as you supervise. Around the age of 6, permanent molars will become to come into your child’s mouth. Having thin protective coatings applied to these teeth can help to keep decay from forming in the pits and fissures of the teeth. Plain and simple, sealants can reduce the amount of cavities that form in a child’s mouth. There are many different thoughts on fluoride. Some people think that fluoride should be used in great amounts, while others think it should not be used at all. We fall somewhere in the middle ourselves. We think that fluoride can be beneficial to teeth but it should be used in the right amounts. Since fluoride is used to strengthen tooth enamel, using it will lead to less decay. Many of the toothpastes that you can purchase at your local convenience store sell plenty of toothpastes that contain fluoride, making it easy to obtain and treat your teeth with on a daily basis. This may seem like a no-brainer, and yet so many people still do not do it. 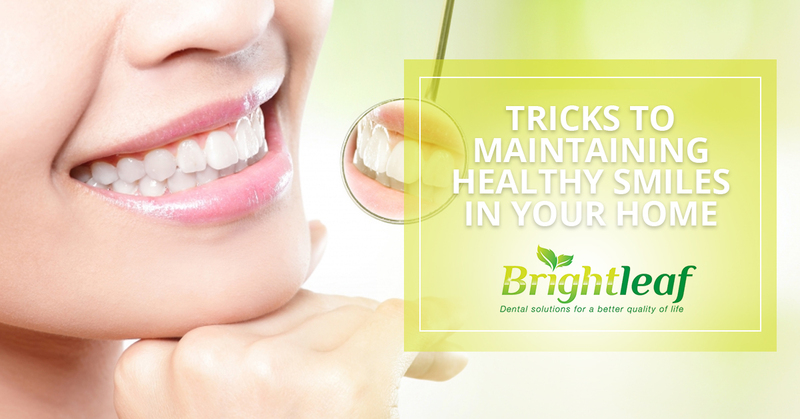 In order to have healthy teeth and gums, you need to brush at the very least twice a day. Additionally, you need to make sure that you are flossing at least once a day. It is also important to remember that your toothbrush should be changed out three to four times a year if you want your brushing to be effective. In addition to brushing and flossing daily, you should absolutely rinse your mouth out with mouthwash after you eat. If you do not have access to mouthwash, chewing sugar-free gum can also protect your teeth as it increased saliva flow, which will wash away the bacteria naturally and neutralize the acid in your mouth. If you are someone who participates in sports or recreational activities, you may not think about the safety of your teeth, but you really should. While being active, we would suggest that you wear a mouthguard of some sort to protect your smile. One of the best ways to get a healthy smile is to give your body nutrients. Eating foods that are healthy for you is not only good for your heart health but also it aids in the health of your smile. Eating whole foods such as grains, nuts, fruits, and vegetables will help your teeth to remain strong. These foods are also likely to reduce inflammation which will lower your risk of gum disease. If you are ready to make oral health a priority in your home, it’s time to do so now. While this may seem like a lot to tackle at first, there is no need to worry. Your Santa Monica Dental Team at Brightleaf Dental can help you and your family to make the very best decisions when it comes to the health of all of your smiles. Contact us today to schedule a cleaning or dental exam for the whole family. We would be happy to help you!